I'm back! Finally! I still don't know how often I'll be posting, because to be quite honest, my ankle surgery was a lot more invasive than I originally thought it would be. It's taken a lot out of me and I'm still trying to get back in the swing of things, especially since I'm currently on bed rest at my mom's house in Cleveland instead of back in my apartment in Los Angeles. But I'm doing my best to continue to update The Beauty of Life and I definitely appreciate you all sticking with me while I (quite literally) get back on my feet. Let's kick things off with this glorious addition to On Wednesdays We Wear Pink: Dial Silk & Magnolia Restoring Body Wash.
Now, I've made no secret over the years of how much I adore body wash. I actually have quite the problem (read: obsession) with it. In my shower at home right now, I think I have about 10 body washes queued up for use, with more waiting in the wings. I like choices, what can I say? Well, Dial Silk & Magnolia Restoring Body Wash immediately found its way onto my shower caddy and into my heart. My beauty arsenal is still at a minimum (for a refresher, be sure to check out the products I used in the hospital). But I was more than happy to add this sweet-smelling product to my small collection at once. The rich formula lathers wonderfully -- all you need is a dime-sized amount on either a pouf or a washcloth to create tons of deliciously scented bubbles. And because it's enriched with silk proteins, it instantly makes skin so soft and smooth. I also love how beautiful the product looks in the bottle. It's a gorgeous swirly mass of pink and white that just makes me want to dive right in. I honestly can't imagine my life without this bottle in it! I've been using this body wash religiously and don't see any signs of slowing down in the near future. I just can't recommend it highly enough. 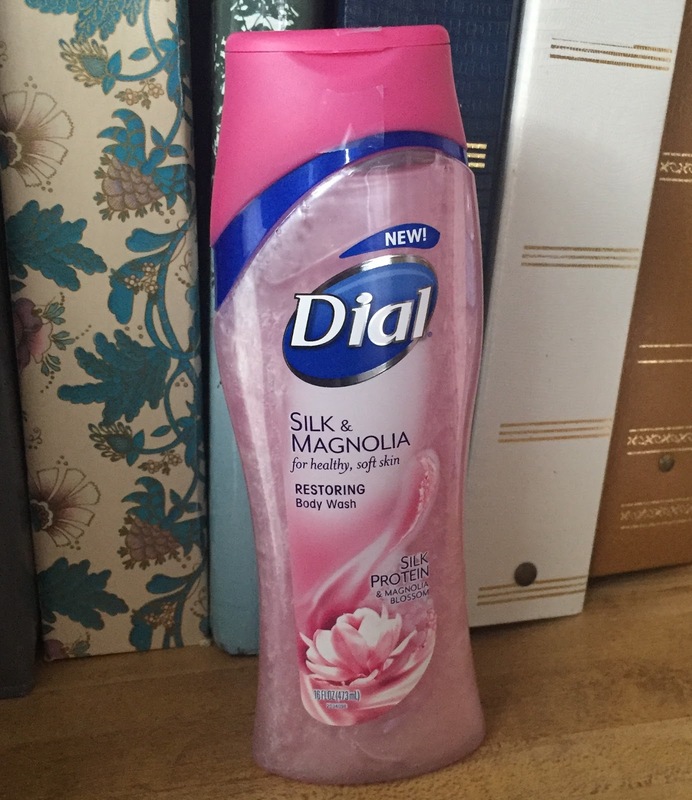 Dial Silk & Magnolia Restoring Body Wash retails for around $5 at drugstores nationwide. I'm glad that you're at least out of the hospital and visiting with your mom. Glad that you're blogging too! I have never tried a Dial body wash, but clearly I should. I'm glad I'm not the only one with 10 shower gels in my crowded shower! Congratulations on being out of the hospital! This body wash sounds fantastic! Welcome back. After I broke my leg the hardest thing for me was to take pictures. I rotate my washes in the shower too. Glad you're back - hope you heal soon. I love me a good body wash and this sounds nice. Welcome back! Hope you feel better soon! I love the Dial body washes! Glad to see you back! I'm a total shower gel junkie too but this one is new to me. It sound great, and it's so cute! Ohh I like the sound of this scent! Glad to see you posting again!